Relevance. 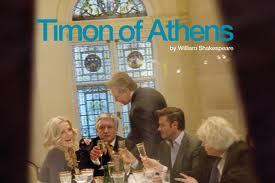 From the moment that Timon of Athens was announced as part of the upcoming season at the National Theatre with its look-alike poster image, it was clear that this would be a production straining for resonance in the modern world. This is nothing new of course – the recent Antigone opened with an evocation of the capture of Bin Laden, the RSC have relocated Julius Caesar in a modern-day African dictatorship, numerous Comedies of Errors have touched on people-trafficking – but in his quest to update this neglected Shakespeare problem play for our times, Nicholas Hytner seems to have suffered very much from square peg round hole syndrome. Aspects of this production may well improve as the preview period progresses, my problems with it ran much deeper. Timon starts the play as a major player on the London social scene, showering the city and his acolytes with his financial largesse and a dubious open door policy. But such cultural and personal philanthropism comes at a serious price when it emerges that Timon is in fact bankrupt and when he turns to those who he has lavished with money and gifts, they turn their back on him and offer no help. He exacts a stinking revenge on them during a feast and then retires from society to become a bag lady. Even then, an unexpected discovery means that he cannot truly escape his former life but his influence is channelled into a darker stream of action as civil unrest is steadily growing. Clearly, the play’s themes of the unsustainability of conspicuous consumerism and the selfishness born of such greedy materialism have a powerful currency in the modern world and the opening images of the (pre-)show invoke the spirit of the Occupy camps. However, the social turmoil that bubbles under for the most of the show is more directly evocative of last summer’s rioters, which casts a slightly different complexion, muddying the water a little as the point being made here. And try as they might, the updating to modern scenarios feels painfully forced and very rarely a natural fit. Part of the problem undoubtedly lies in the play itself, largely acknowledged to be a collaboration with Thomas Middleton and an unfinished one at that. For those in the know, this production uses the 1623 First Folio text with cuts and amendments to about 250 lines and small portions of text included from other Shakespeare plays. Not having seen the play before, I’ve no point of reference aside from to say that on first viewing, it lacked dramatic impetus and narrative clarity. Only in the second half does it start to come together, as the high conceit is dropped and Timon’s introspection is allowed to breathe simply. Whilst the Travelex season is undoubtedly one of the best things to happen to the National in recent years, it has had an unfortunate knock-on effect on the budget for shows and this is often most painfully apparent in the set design. Faced with the cavernous space of the Olivier, Tim Hatley condenses the space by inserting a large wall which is then endlessly flexible in creating the various city scenes of the first half. Some, like the gallery that is named after Timon and the party room with its dance scene (a team of seven Royal Ballet dancers are alternating the two roles here in a rather oddly ostentatious move), work effectively; others, which rely on the dropping in of painted London backdrops, seen through a large window, are cheap and tawdry. I wasn’t much keen on the wasteland look of the second half either. Performances are still percolating, but once again Hytner’s approach was not one I was inclined to. Simon Russell Beale (an actor for whom I have yet to have that Damascene moment with) appeared a little too occasionally like he was treading water, familiar mannerisms abounded and little psychological depth felt explored. The Lear-like casting out into the wilderness was his high point, but the poignancy marred by his frequent flouncing around (for want of a better term) in the too-large space. Ultimately though, this was just not a character in whom any interest developed for me. However, a greater crime is the muting of Deborah Findlay’s natural vivaciousness. As Flavia, the gender-swapped faithful steward, she feels slightly mis-cast, the chemistry with Russell Beale not currently working and the style of vocal delivery chosen is curiously flat and just doesn’t play to her strengths. In a large supporting cast, the predominant note is of broad over-playing which makes it hard to get really involved with these scenes and keep track of the sub-plots. Only Hilton McRae’s gnomic Apemantus and Ciarán McMenamin’s spirited rebel leader Alcibiades emerged with any real credit. And to characterise the whole muddled approach, Hytner flips the whole style of the show in a bizarrely directed final scene which comes out of nowhere and radically alters the mood, just as the production was finally finding its feet. It left me perplexed and simply served to highlight my disappointment with the whole thing, especially as it is part of the London 2012 Festival and the World Shakespeare Festival. The audience around me largely disagreed (though one got the feeling they would have ecstatically applauded Simon Russell Beale had he just sat down and read the paper for 2 and a half hours) so who knows – it’s a could-do-much-better from me. Thank you! I saw the play on 10 July and agree with your perceptive comments. Good review. The critics predictably fawned all over SRB and the painfully worked 'timely' relevance which seemed to miss the point that the story was substantially different to the current financial crisis. Utterly missable stuff.